Two years ago, we announced the rehabilitation of Swains Lockhouse and successfully raised $75,000 for the project. Well, the wheels of historic preservation sometime turn slowly, and we encountered several delays while we looked for a contractor who could restore Swains to its former glory in a fiscally-responsible manner. We persevered and are thrilled that construction began last week on the rehab! The contractor will begin with a demolition of existing first floor, followed by an installation of new first floor joists to make the floor structurally sound. From there, they will jack up and level the second floor; add new LVL laminated joists to brace the weight of the second floor and roof structure; and jack up, align, and secure the roof structure. This will provide a structurally-sound base for their next project: to install a brand new standing seam metal roof, just as the Lockhouse would have had in 1916. When complete, Swains Lockhouse will join our award-winning Canal Quarters program as the seventh lockhouse that is available to guests for overnight stays. Swains will be unique in that it will be the first multi-purpose Canal Quarters lockhouse, due to its larger size thanks to a 1890s expansion. Part of the building will house the Canal Quarters program, with accommodations for up to eight guests. 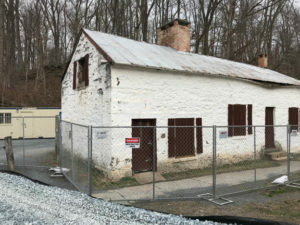 When not in use as a Canal Quarters residence, the newer part of the building will become a designated space for the Canal Classrooms program. Students on educational trips to the Park will be able to participate in learning activities in this space, only steps away from the canal, Lock 21, and the Potomac River. Each lockhouse currently in the Canal Quarters program was rehabilitated and furnished to depict a specific time period between 1830-1954. Each tells a story of a period of Canal history, and visitors are able to spend up to three nights in the lockhouses. Swains Lockhouse will interpret 1916, when the canal was transitioning from a transportation route to a recreational space for the public. Swains Lockhouse is well known locally due to the Swain family, generations of whom lived in it from the early twentieth century. They operated Lock 21 until the canal closed to navigation by boats in 1924. After the Park Service took over the property, the Swain family ran a refreshment stand and boat rental from the lockhouse, until it closed in 2006. The Swains Lockhouse will feature electricity and running water when it opens as a Canal Quarters lockhouse.